Details about RETRO 51 ALBERT EINSTEIN TORNADO VINTAGEMETALSMITH ROLLERBALL PEN NEW!! 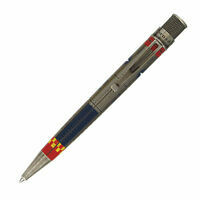 Retro 51 Tornado Popper "Peace Love Happiness" XRR-14PS #004 !!!! SPECIAL ATTRIBUTES 2: SUPER FUN GIFT PACKAGING!